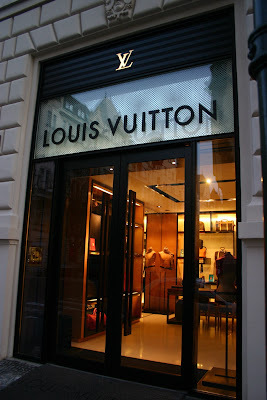 Entry to Louis Vuitton shop in Parizska street. I told you yesterday there are some fine fine shops in Parizska street. And I didn't mention that this street is full of trees and looks wonderful during summer. It starts just at the Vltava river and goes to Old Town square (or Staromestske square if you want). By the way, it's very windy and rainy in Prague ... and I guess it is the same at more places in Europe.